Elephants have been part and parcel of South Australia’s history for more than 160 years. The first elephants arrived in Australia in 1851 and one of them, Jumbo, arrived after a short stay at Hobart and Melbourne at Port Adelaide a year later. He was walked to Adelaide and put on display at the Edinburg Castle Hotel in Currie Street. For a few years he was owned by Thomas Bentley of the Cremorne Hotel on Unley Road. His next owner was John Smith of the Smithfield Hotel and later Charles Matthews of the Gepps Cross Hotel. He died in 1858, only eight years old. There have been several other elephants since that time but Sumerling’s book is mainly concerned with the fourth elephant, Samorn, who called the Adelaide Zoo home. 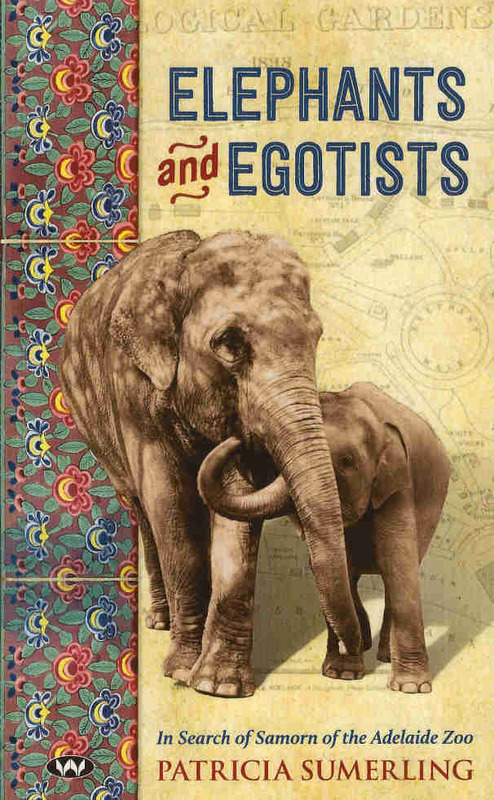 She also covers some of the history of the zoo and its managers and elephant keepers. The book is attributed to Samorn who, while being loved and adored, made a lasting impact on Adelaide’s children and adults alike. What unfolds is an interesting and useful historical insight on how we used to look after animals generally and elephants in particular. It discusses our changing attitudes about keeping animals in cages, lock-ups or any form of enclosure as well as for the use of medical experiments. It also highlights the often gruesome reality of our zoo/elephant history. Luckily the days when elephants were seen as beasts of burden and providers of entertainment have mostly passed but sadly still exist in some regions. The book is a plea for the protection of elephants and wonders if they still have a place in our overpopulated cities. In many countries their survival is nothing short of critical. Illegal logging and alienation of forests have proved disastrous for the survival of elephants and other wildlife. In one country alone the elephant population has fallen from 100.000 in 1900 to less than 5000 in 2006. No wonder Sir David Attenborough asks; are we happy to suppose that our grandchildren may never be able to see an elephant except in a book? Thankfully much has also changed in the way zoos keep elephants. There is now a much greater awareness and understanding about what is needed to keep them healthy and content. The first elephant at the Adelaide Zoo was Miss Siam, a gift from Sir Thomas Elder who had her shipped from Siam (Thailand) in November 1883 on the steamer South Australia. She was at the zoo for twenty years and provided entertainment and rides for thousands of children. She, and the later elephants, proved a financial success for the zoo. They earned their keep with plenty to spare. When she died on 7 May 1904, she was stuffed and can still be admired at the South Australian Museum on North Terrace. After a hectic six months, elephant number two arrived from Ceylon (Sri Lanka) as an eight year old in November 1904 and was named Mary Ann. Giving rides to children for nearly thirty years she earned more in a 2½ hour working day than her keeper in a week. With the high cost of feeding an elephant, which can eat up to a hundred kilo of food a day, and running the zoo in general, no time was lost to obtain a replacement for her when she died in 1934. This one, named Lillian and only four years old, was the third elephant to reign at the zoo. She also hailed from Ceylon and was shipped to Adelaide via the Singapore Zoological Gardens in May 1934 at a cost of £165. Lillian remained active until 1952. Although only 24 years old Lillian was in real poor health. Suffering from rheumatism, stiff joints and continuous pain it was decided to do away with her. The task of ending her misery was given to Sir John Keith Angas who shot her on 2 May 1956. The fourth and last elephant to come to the Adelaide Zoo was Samorn in 1956. It is Samorn who provides the main topic of Sumerling’s book. Samorn was a ‘gift’ of the Thai Government which cost the zoo only £550 plus a consignment of Australian animals. On top of this came another £210 for defaulting on another contract. Be that as it may, Samorn arrived in Adelaide on 30 November 1956. According to her keeper Dave Cody, who had trained her at Taronga Park for six months, she was the friendliest and smartest of all the elephants he had known. From the first day of arrival Samorn was the star attraction for every visitor and remained it for more than 35 years. She too was adored by the public and Sumerling has included some hilarious anecdotes about her and her keepers. One of the best liked and remembered of her keepers was Dutch migrant Hero Nuuns who was appointed in September 1963 and looked after her for the next 25 years. Nuuns was also liked by William Lancaster who was appointed director in April 1964. He ran the zoo in a vastly different way to his predecessors and took it out of the Edwardian age. He introduced many new innovations. Lancaster could swear as well as, if not better than most Dutchmen as he had been a POW with Dutch prisoners and had also worked on the infamous Burma Railway. Sumerling has looked at some of the problems associated with the Adelaide Zoo and its managers. For its first sixty years the zoo was managed by three generations of the Minchin Family. They had to deal with the old fashion ideas of some of the egotists belonging to the Royal Zoological Society of South Australia, which made it often impossible to get good results for whatever they proposed. It was with the later managers that real progress could be made and one animal that benefitted most was Samorn the elephant. She is remembered affectionately by journalists, photographers, TV entertainers, poets, writers, cartoonists and last but not least by all the grown-up children. Many stories about Samorn and Hero have been retold in Victoria Raine children’s book Elephant in our Zoo. When Samorn died at the Monarto Zoo in 1994, where she had spent her retirement, she was buried in a nearby quarry, but 18 months later exhumed as the University of Adelaide showed an interest in her carcass. It took them six months to assemble her skeleton. Sumerling’s vivid portrayal of a lovable animal will go a long way to changing our thoughts about animals and their use and treatment. One cannot but agree with Leo Oosterweghel, a previous employee of the Adelaide Zoo and now Director of the Dublin Zoo, Ireland, who found the book well researched, fascinating and an excellent read. He recommends it to anyone with an interest in history and in the way we used to look after animals. He is convinced that Samorn would give it her stamp of approval.